Norway is widely known for its many mountains, its mile long, vivid coastline and its many fjords. Due to the last ice age, the Norwegian landscape was shaped for thousands of years when the glaciers carved the mountains into these beautiful fjords, especially located on the west coast. For many Norwegians, this is one of our proudest ‘show offs’ when it comes to the beauty of our nature. In summer time, farmers harvest and produce some of the best Norwegian quality foods, mostly fruit and vegetable based products. However, in a geological perspective, the accessibility is not always cooperating with today’s transportation. It means that the inhabitants don’t always have access to some of Norway’s finest cultural scenarios, without traveling for miles and days. In autumn of 1959, the inhabitants of Hordaland county was offered their very own book boat. The purpose was to expand the cultural scene. At that time, the boat was called Abdulla, but they changed the boat and the name in 1963 into ‘Epos’, creating an even wider connotation to its purpose. Epos became the floating cultural scene where books and other events were made available to the people living in the middle of nowhere. Now days, the boat works as a floating library in winter time and tourist boat in summer time. Epos now offers its service to two other counties: Møre og Romsdal and Sogn og Fjordane. Epos’s main purpose is to enrich hamlets, located in the west coast of Norway, that don’t have their own libraries. And it’s very popular, something that the lending figures shows. The floating library contains over 4000 books and audio books. – We see that the people, especially kids, find this initiative very amusing and they are always looking forward to Epos’ arrival. 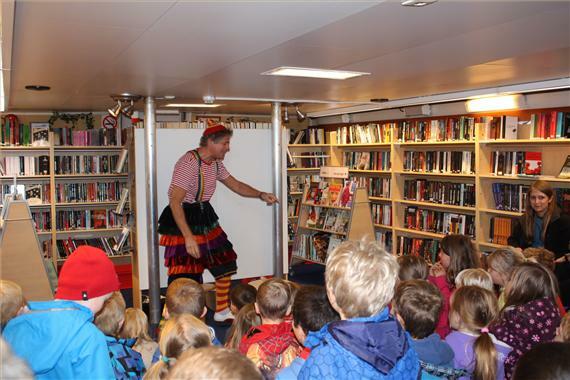 We can also offer additional shows, for instance puppet shows, clowns, circus and visits from writers. Our most eager lenders are school children and elderly people, says librarian Joep Aarts to ThorNews. According to the Norwegian Law, library services are free of charge and therefore available for everybody. Similar peculiar library services can also be found in Mexico with its ‘Biblioburro’ and in Kenya with its ‘Camel Book Drive’. Is it possible to find the route of Epos and scenic landmarks along the way? The home pages of Epos is unfortunately only in Norwegian. Winter routes for 2013 started on 22 January and ends 14 February. The boat will be visiting villages in Møre og Romsdal county.